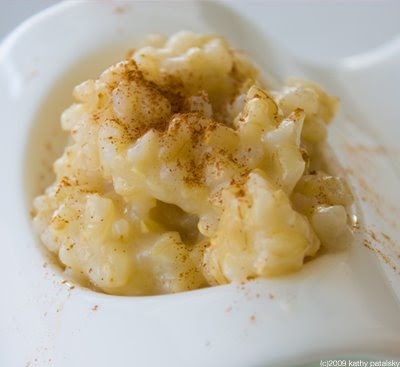 Vegan Rice Pudding. Dessert and Breakfast Approved. Vegan Dessert for Breakfast. A typical vegan breakfast can get a bad wrap. Fruit salad, tall glases of green juice, thick smoothies and vegan oatmeal may all sound a bit too healthy to the critics. I get it. Sometimes we crave something sweet, starchy and comforting in the morning. And since we all know that buttermilk pancakes and jelly-filled donuts are a healthy eating no no, we're left with few options to satisfy. Until now. 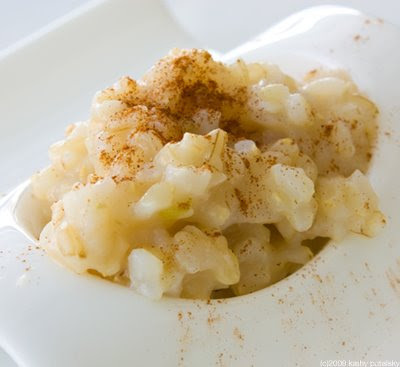 Here is a yummy brown rice pudding recipe perfect (and healthy enough) for breakfast. It's high in protein (from the tofu), fiber (from the brown rice and cashews) and antioxidants (from the fresh fruit). *short or long grain will work. I like short. then slowly adding the additional liquid (non-dairy milk) and seasonings on medium heat. First, add the rice, water, salt and butter to a pan. Bring it to a bowl over high heat. Cover with lid, reduce heat to low. Simmer rice for an additional 30 minutes, until liquid is absorbed. Next, turn heat to medium and stirring constantly, add all the coconut milk until it has been sufficiently absorbed. Be sure to uncover lid so that steam can cook off the rice. Next fold in the vanilla extract, cinnamon and agave or maple syrup. Cover with lid and allow to sit for ten minutes. Serve warm or store in fridge to serve cold. *Sprinkle a bit of cinnamon and a drizzle of agave syrup on top before serving. Bring it to a bowl. Next fold in the tofu with 1/3 cup of coconut milk and cover lid. Allow to cook on medium heat for 5 minutes. The hot rice will help cook and flavor the tofu. Next, while stirring constantly, add all the coconut milk until it has been sufficiently absorbed. Next fold in the vanilla extract, cinnamon, cashews and agave or maple syrup. Note, it's OK if the tofu crumbles a bit. Fill a bowl half way, then top with fresh cut fruit. Mangoes, berries, bananas and peaches work very well. Recipe Notes: If you do not have Coconut Milk beverage, you can easily substitute almond, soy, rice or hemp milk. However, try not to use a low-fat version because all the creaminess comes from the milk option you use. If using an alternative milk you can add in a Tbsp of canned coconut milk or oil if you crave a coconut flavor.